24/7 ONLINE OPEN HOUSE - Does it work for you? We provide panoramic photo (also known as "virtual tours" or "3d tours") Internet marketing services for Ottawa real estate brokers and home owners. Our multimedia virtual tours boost the effectiveness of ALL your existing online listings (including MLS,Ottawa Real Estate Board - OREB, Grapevine and others). They also work as a stand-alone visual presentation tool at the same time. How do you know if the service is for you? With an impressive array of unique practical features, Photohug is quickly becoming the secret weapon that allows tech-savvy Ottawa brokers to stand confidently above the rest when it comes to quality home presentation. 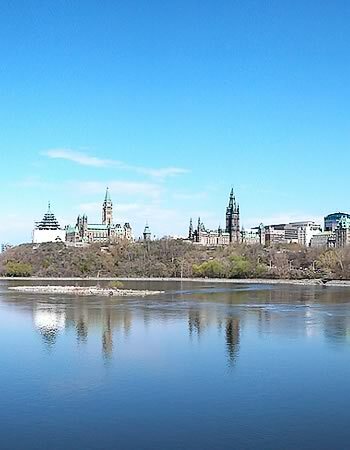 Parliament Building in Ottawa, view from Victoria Island. Part of a demo virtual tour shot by Photohug.